Les Leopold talks about his new book, Runaway Inequality: An Activist’s Guide to Economic Justice. It’s about how wealth and income inequality are strip-mining our economy and destroying communities across America. Then — with massive voter purges and hackable voting machines, are American elections really clean and fair? We hear a clip from a recent speech from election integrity expert Robert Fitrakis. He’s got a new book out, co-authored with Harvey Wasserman — The Strip And Flip Selection of 2016. The US has the highest level of income and of any advanced western nation. It’s causing third world style poverty in the richest country on the planet. It’s become a key issue in the 2016 presidential primary. A standard line in Bernie Sanders’ stump speech is that the top one tenth of 1% own 90% of the nation’s wealth. That claim may seem extreme, but at least one respected academic study found that it’s true and Politifact rated it “Mostly True.” Moreover, the bottom 40% have negative net worth: they owe more than they own. And income and wealth inequality in the US is getting worse. 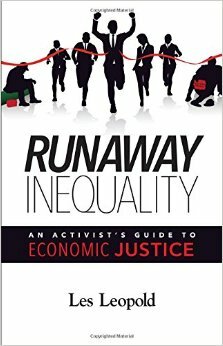 Les Leopold calls that “runaway inequality.” His new book Runaway Inequality: An Activist’s Guide to Economic Justice says it’s strip-mining our economy and destroying our middle class. In fact, Leopold says, it’s at the root of all our major societal problems, from mass incarceration and a broken health care system to infrastructure decay and climate change. Leopold’s book is meant to kickstart a national conversation about economic inequality. Learn more at https://runawayinequality.org/. A recent study by Harvard and the University of Sydney in Australia found that the United States had the “worst elections of any long-established democracy.” We ranked dead last out of the 47 countries. Last week, Francesca attended a panel on election integrity in New York City. Next week, we’ll bring you her interview with one of the panelists, Jonathan Simon, about his book, Code Red. But on today’s episode, we play a clip from the presentation of another panelist: attorney, political science professor and election integrity expert Bob Fitrakis. He’s the author of numerous books — his latest (co-written with Harvey Wasserman) is The Strip And Flip Selection of 2016. “Stripping” refers to multiple methods of stripping citizens of their right to vote, like closing registration and polling places in poor and working class neighborhoods, passing voter ID laws, and other means designed to prevent blacks, Latinos, the young and the poor from voting. 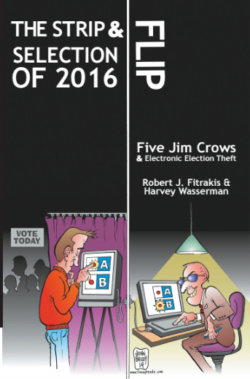 Those who dismiss such warnings as “conspiracy theory” might confront this simple question: “How will the electronic vote count in the 2016 election be verified?” The answer is simple: “It can’t be.” …In the meantime, we have already seen deeply disturbing signs of the “strip and flip” scam in the 2016 primaries. All…have been to the detriment of the Bernie Sanders campaign. Whoever is your preferred candidate, this is something that should concern you. The right to vote is practically a defining feature of our identity as Americans. And our ability to confront the crises we face is contingent on safeguarding the integrity of our elections.